Should you be using 20MP cameras? Once considered science fiction, 20 Megapixel cameras are now a reality for the video surveillance industry. This year, Arecont Vision announced a 20MP camera. That camera is now shipping so we bought a unit to find out how well it worked and what hidden problems it had. Arecont Vision is making a number of audacious claims for this 20MP camera including that it "can replace up to 65 conventional cameras" and that "one megapixel camera can view an entire parking lot ... taking the place of several PTZ cameras." Arecont has also added "binning for increased security." Equally importantly, the Arecont camera is cheap. On a per pixel basis, it's actually cheaper than the $100 HD camera from Ubiquiti and that's saying something. Plus, like other Arecont cameras, it is designed to work with leading 3rd party VMS systems. Finally, it's H.264, rare for a camera with such high resolution. Clearly, the Arecont 20MP has a lot of potential. On the other hand, Arecont Vision was recently and overwhelmingly selected as the IP camera integrators have had the worst experience using. As such, Arecont cameras come with significant risk. AV 20MP vs PTZ - We took an SD PTZ and compared its maximum optical zoom to the Arecont's maximum digital zoom to see who had the better range. AV 20MP vs Super Wide Angle Lens - We took a 1080p camera and a super wide angle lens to see what camera provide better usability and image quality. AV 20MP vs (4) 1.3MP cameras - We matched up a 1.3MP camera against 1 of the 20MP imagers to see how much additional image details the Arecont was able to capture. Low Light Performance vs MP/HD cameras - We examined how much better or worse the 20MP AV camera was compared to 'regular' Megapixel cameras. Low light performance was bad, even with binning turned on. Turning on binning only minimally increased image details. However, binning did significantly reduce bitrate and increase frame rate. Advantage over 1.3MP cameras was moderate. When matching up a 1.3MP with the same FoV as one of the 20MP AV imagers (i.e., 45 degrees), the 20MP AV imager clearly captured more details but moderately so (review images below). This was, of course, offset by the 1.3MP camera's 10x greater frame rate. Image details captured by the 20MP AV was far superior to a super wide angle lens on a 1080p camera. However, since the 20MP AV takes up 4 independent video tiles compared to 1 for a camera with a super wide angle lens, the 20MP AV was more cumbersome to control and display. An optically zoomed SD PTZ captured dramatically more image details than digitally zooming the 20MP AV. This is true even though we used the 180 degree model. If we used the 360 degree model with much wider FoV per imager, the PTZ advantage would be even greater. Frame rate was very low with most tests averaging about 1.5fps during the day, even lower than the specified 3.5fps. Night time frame rate was much higher (about 10fps) but this was offset by a 75% reduction in resolution. 3rd party integration is more challenging than normal megapixel cameras because of the AV 20MP's use of binning. By default, when switching to night mode, resolution is dropped by 75% which can break connection to VMS unless properly and specifically integrated. For example, Exacq released new software to handle this. Day/night cutover did not work and had to be adjusted manually. For a test, this is not a barrier but for production use, this is a real issue. We have not determined whether this is a hardware problem with our camera or simply a case of needing new firmware. Note: we confirmed with Arecont that our camera was on the latest production firmware as of the test . Imagers disconnected when panning camera for setup. Be especially gentle and slow when panning as connectors do not seem to be fastened tightly. Improved aesthetics - the form factor is fairly small even compared to a single imager dome camera. This makes it quite unobtrusive especially since it embeds 4 imagers. By contrast, mounting 3 or 4 cameras even on the same pole could look ugly or give the impression of an area being unsafe. Reduced VMS licenses - many VMS systems, such as Exacq and Milestone, only require a single camera license for the 20MP AV camera even though it operates inside the VMS as 4 separate cameras. This can save $150 - $750 (3 VMS licenses) for VMS systems that license in this manner. Reduced installation time and cost - because the cameras are all pre-populated inside a single housing/assembly, it is much simpler to install than 4 cameras in a single place. Reduced infrastructure costs - eliminates cabling and switch ports which can save a few hundred dollars. Reduced camera costs - a single 20MP AV camera is cheaper than buying (4) 5MP cameras - even from Arecont. This would save a few hundred just on product costs. One commonly cited logistical advantage we do not agree with is savings on trenching and eliminating putting cameras on different poles. The reason designers put cameras in different locations is to get optimal angle of incidents to targets. Super high resolution cameras do not eliminate this need. Indeed, they can actually reduce security quality when trying to capture everything from a single spot. Bad night time performance: This camera can basically not be used outdoors or in areas that are not very well lit. You can add a wide angle IR or white light illuminator but this is going to add $500+ (assuming you are going to cover all 180 degrees) and will create imaging / depth of field issues (overexposure in the near field, too dark in the far field). Low frame rate: At 1 - 3fps, this is extremely low. While frame rate is secondary to resolution, frame rates these low are a risk and are a negative to most users. Fixed range / focal length: If you want to see something farther away, you cannot adjust as you could easily do with varifocal lenses. Basically, if you want to see details of people or vehicles, the max radius from the camera is about 50 to 75 feet. Wasted areas: Because the view is fixed and wide, it will cover areas that are not relevant for one's surveillance use. To that end, you might find even 2 fixed MP cameras aimed at key areas to do a better job at a lower cost. Because of the bad low light performance, this camera's best fit is for indoor applications with controlled artificial lighting. Because of the very low frame rate, this camera's best fit is as supplement overview shot that complements traditional surveillance cameras covering key spots. We can see this camera as very useful in retail providing a low cost yet broad visual overview of a store used in conjunction with cameras at the entrance and at cash registers. We do not recommend using this camera as a PTZ replacement due to its limited range (relative to PTZ optical zoom), poor low light performance and low frame rate. However, we do believe it makes a nice complement to PTZs providing a constant record of a scene (at least during the day). We do not recommend using this camera as a replacement for multiple fixed cameras unless you were already planning to put multiple fixed cameras in a single spot and can handle the low light and frame rate issues. For those wanting a 180 or 360 offering, we recommend considering the Arecont 8MP version as a potentially better real world alternative. While the 8MP has 60% less pixels, that deficiency will not make a big practical difference even during the day when additional pixels have the most value. However, the 8MP has a higher maximum frame rate (spec'd at 5.5 vs 3.5 for the 20MP) and, we would presume, better low light performance than the 20MP version. Finally, the 8MP version costs a few hundred dollars less (~$1400 online vs ~$1700 online for the 20MP). Finally, make sure to check specifically for support of this camera on your preferred VMS. Because of the binning mode, just because a VMS supports Arecont cameras generally does not guarantee that they support this specific series and the default binning mode. The video below reviews the physical setup of the Arecont SurroundView camera. We cover panning, tilting and most importantly (1) adjusting the focus and (2) being aware of connectors disconnecting during panning. Let's start with low light at near dark 0.2 lux. As we do in all low light test, we normalized the shutter speed for all cameras to 1/30s so no cameras could 'cheat' with a longer exposure. 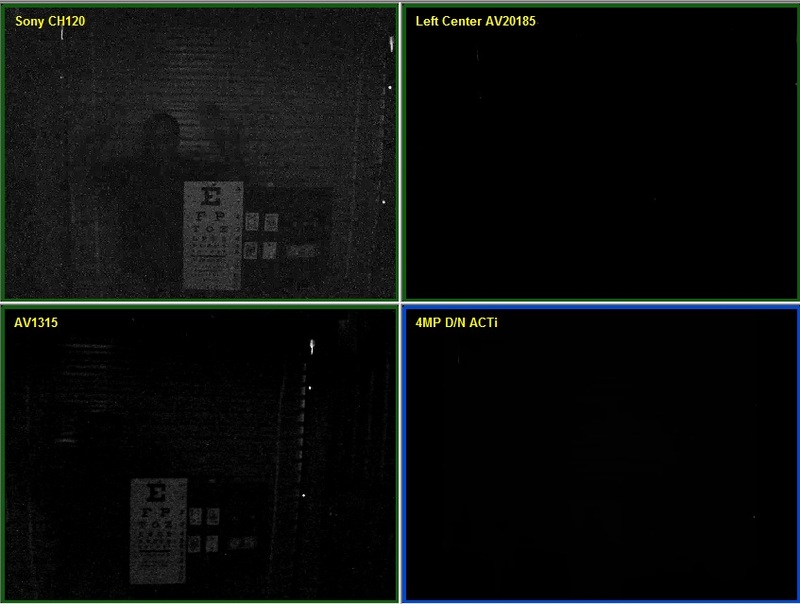 The comparison below show that the 1.3MP Sony and Arecont produce some details but that the 20MP Arecont and the 4MP ACTi are simply pitch black. It is important to remind here that the 20MP Arecont is made up of (4) 5MP cameras and that the low light performance is roughly equivalent to 5MP cameras generally. At 0.2 lux, it did not matter if the camera was in binning mode (1.3MP per imager) or not (5MP per imager). They were both pitch black. Now, in the image below, we show the results of a 1 lux test. 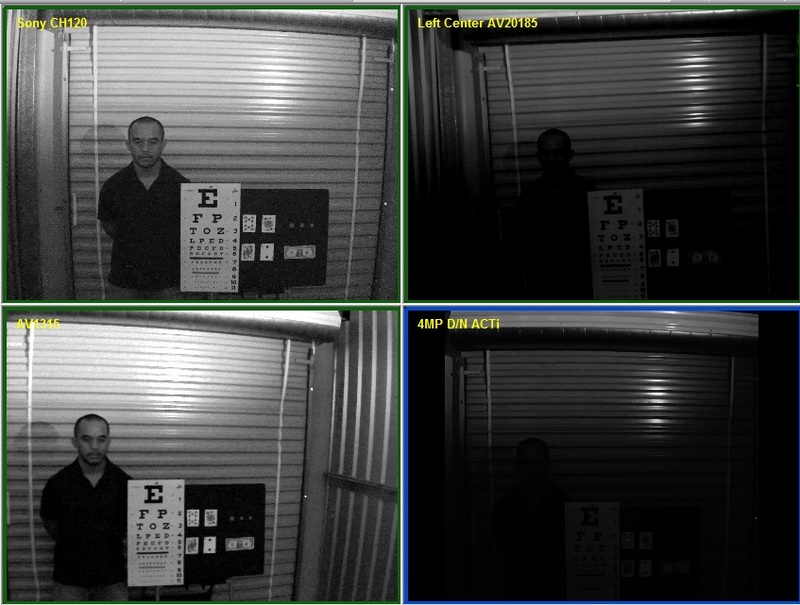 The 1.3MP cameras now show significant details but the higher resolution cameras on the right only show the highly reflectant eye chart but nothing of the subject. Now let's look below at the cameras at 2 lux. The 20MP Arecont is finally beginning to show most of the scene however the test subject is still mostly dark. The image below shows that when binning is turned ON, the image quality is only modestly improved. If you look closely at the eye chart, the Binning ON (1.3 MP per imager) version has less visible noise than Binning OFF (5MP per imager). However, the big positive is that bandwidth consumption dropped 60% from 1Mb/s to 400 Kb/s while frame rate jumped by 500% (from ~2fps to ~10fps). Binning is definitely worth doing but does not make the image quality or 'brightness' anywhere close to a real 1.3 MP camera. Below are the results from 6 lux, a light level with fairly significant light. This is the first level where the Arecont 20MP shows a fairly clear and clean image. The subject is still darker than in the 1.3MP camera but the image is clearly usable. The potential weakness of fixed cameras, including the Arecont 20MP versus PTZs is always an issue of maximum range. If a subject or suspect is too far away, any fixed camera, regardless of the resolution may be incapable of rendering the necessary details. The image below and specifically, the red boxes, show a spot about 200 feet away that we want to zoom in on. The next image shows, on the left, an optical zoom for the PTZ and a digital zoom for the 20MP AV camera. While the PTZ shows the details letter of the sign, the text displayed on the AV 20MP image is illegible. We repeated this process for a human subject about 200 feet away on the other side of the street again zooming into the areas displayed on the red boxes below. As the image below show, on the left, the optically zoomed PTZ clearly and crisply show full facial details while, on the right, the 20MP AV only shows an outline of the subject's clothes. 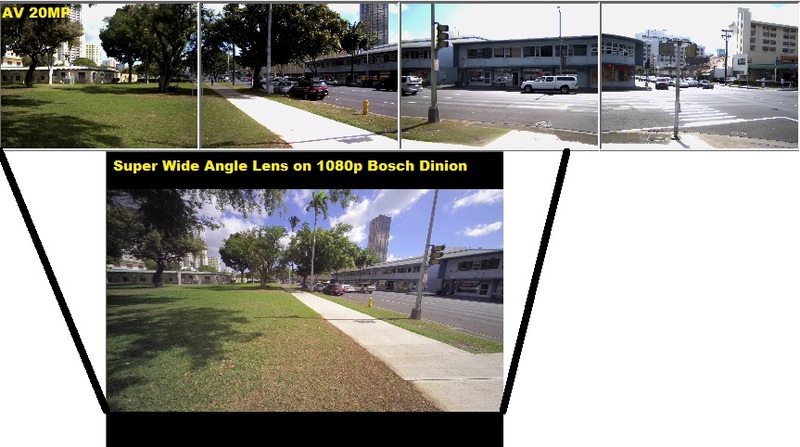 Next, we take a look at using the 20MP versus a 1080p Bosch camera with a Theia super wide angle lens. As the image below demonstrates, the Bosch/Theia combo captures about 2/3rds of the total FoV of the 20MP Arecont. The 20MP clearly has an advantage in total coverage area. However, the Bosch/Theia is displayed in a single pane inside the VMS and is easier to use / zoom than the Arecont which is fragmented across 4 individual input/VMS panes. More importantly, as the image below shows the 20MP Arecont captures far greater detail than the 1080p Bosch with the Theia lens. This is clearly a result of the Arecont's greater resolution. However, the narrow FoV of each individual 20MP AV imager also plays a role because Arecont can individually adjust the exposure for different segments of the 180 degree FoV. A 1080p camera will provide much better low light performance than the 20MP AV. The frame rate of the 1080p camera is far higher than the 20MP AV. A 1080p camera with a Theia lens is $500 or more less expensive than the 20MP AV. There are important advantages and disadvantages that cut both ways so it's not easy to simply say one is better or worse than the other. Since the 20MP Arecont is comprised of (4) 5MP cameras, we wanted to see how much of an improvement they provided against regular, individual MP cameras. 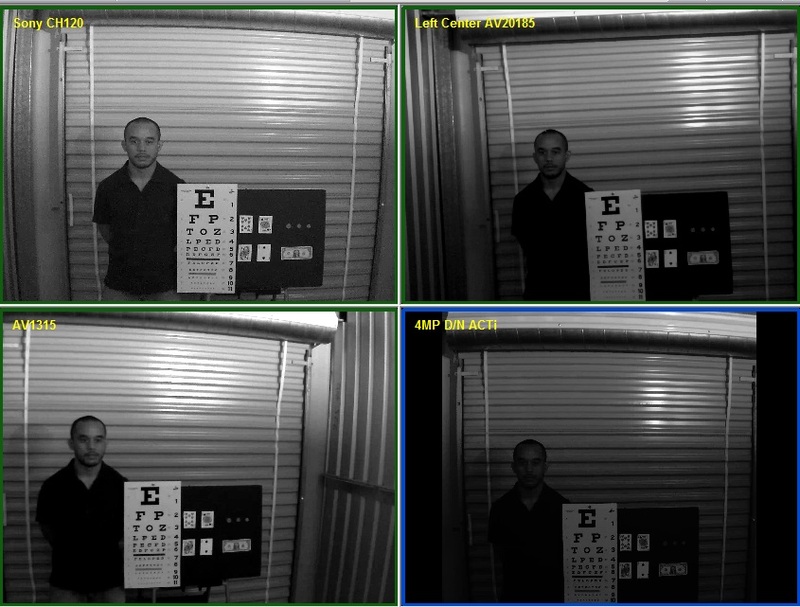 In the following tests, we took 1.3MP cameras and matched up their FoV (45 degrees) with one of the 4 Arecont imagers. 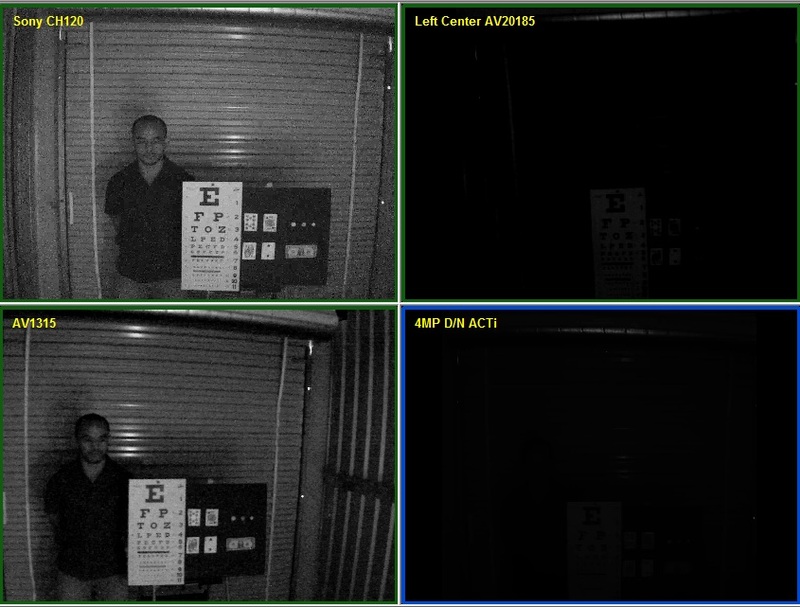 The first image below, of an eye chart in a 10 foot wide FoV, with even bright lighting (120 lux) shows moderate but clear advantage for the 20MP AV camera. The biggest difference is clear in the Queen of Diamonds that the 20MP AV renders much shaper and more detailed. Next, we look at the same scene and lighting with a human subject. All 3 cameras produce effectively the same level of details. However, this is primarily a factor of the narrow FoV which minimizes differences between cameras of varying resolutions. To better understand real world differences we conducted tests outdoors. In the image below, the subject is about 200 feet from the camera (in the same spot used for the PTZ comparison). While the 1.3MP only displays a blob of a person, the 20MP AV shows a clear outline of the subject. It's not 400% better but it is better. Finally, here's another example at an intersection about 100 feet away from the cameras. Here the gap in performance is less pronounced though the 20MP AV still captures slightly more details. This scene had greater sunlight and we suspect that the increased sun diminished the performance difference. Finally, in both indoor simple tests and outdoor complex tests, frame rate tended to average about 1.5 to 2fps. This is compared to 3.5fps specified by Arecont Vision (technically it is listed as 'up to 3.5fps'). You can see for yourself by watching the video exports of a simple scene with arm waving and a complex scene with cars driving through an intersection.